Smooth , no special know how or coding required. A complete Kayako to Jira Service Desk data migration instrument. Help Desk Migration does not require any specialized competencies or knowledge to get started with the migration. The migration is done over a protected connection, and all your credentials will immediately be deleted after you complete the data migration. Our service allows mapping standard and even custom fields , thus letting you be sure that the records end up in the right destinations in Jira Service Desk. When migrating your data from Kayako to Jira Service Desk we maintain all relations between tickets and their respective contacts, attachments, etc., thus retaining the history info. 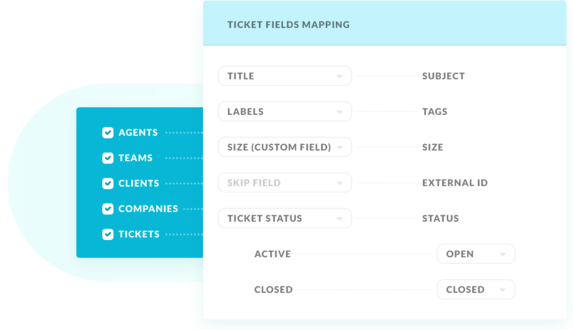 Start with preparing Agent profiles and all needed custom fields in your new help desk. Now, get started on migrating your data from Kayako to Jira Service Desk. Fill out the form with required credentials to allow our data migration tool to access data from your current help desk. Do the same action to connect our service with the new help desk and thus make it possible to import the information. Try out our Free Demo Migration to check how the data migrate. You will be able to view 20 tickets in the new help desk in a few minutes! Once everything's tested out, find a quiet time with the minimal load on the support team and begin migrating from Kayako to Jira Service Desk. We take the protection of your data seriously, so we apply, as well as develop our own, best practices and methods to protect it. See yourself that switching from one help desk to another is easy even if you're not computer savvy. Our staff would be more than happy to perform a personalized migration in case you have specific demands.